Our feeder is getting plenty of bird visitors.﻿ In addition to the usual suspects – titmice, chickadees, woodpeckers, cardinals, nuthatches, sparrow, and finches – we are happy to announce that two male rose-breasted grosbeaks have arrived the other day. 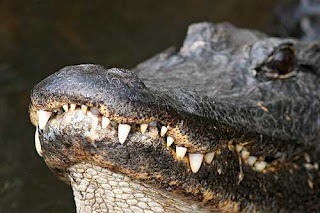 One species baffled me lately, however. Were they common redpolls, very colorful house finches, or purple finches? I could never be sure when I spotted them through the binoculars. 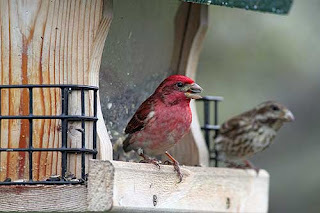 When I recently photographed Mr. and Mrs. Finch at our feeder we decided that they were indeed purple finches. The difference between house finches (introduced from the western U.S.) and purple finches is subtle and the best way to determine it is by looking at the tail. The purple finch’s tail is split. Perhaps we have had purple finches before and just didn’t know it. Such are the thrills of backyard birding. You never know who will come to your feeder next. 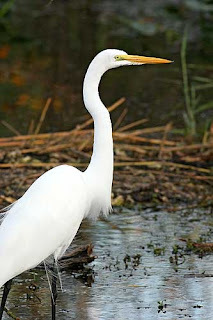 Snowy egrets and great blue herons migrate to Pennsylvania, but they are very photo shy. They won’t let me come closer than a quarter of a mile before taking off. I was therefore thrilled how tame those birds are in Florida. 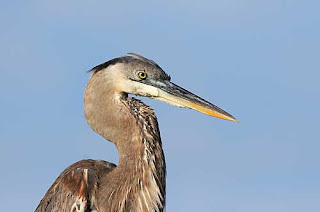 This heron was sitting on top of a shelter, providing me with an uncluttered background. Others stalked through the grass right next to the trail. 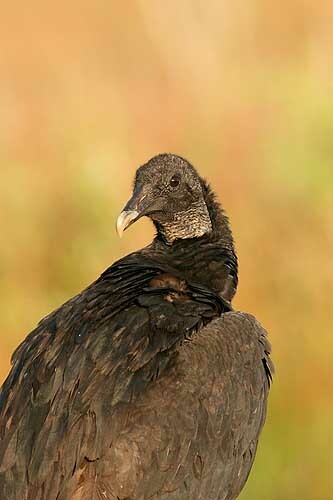 Would that I could photograph a rookery in such close proximity! Last weekend I attended a bird photo workshop in Florida’s Everglades. Sixteen eager photographers attended the workshop, which was led by Arthur Morris and Denise Ippolito. It was still dark when we headed toward the Anhinga Trail for the first of three field sessions. Here are two photos I took on the first day. 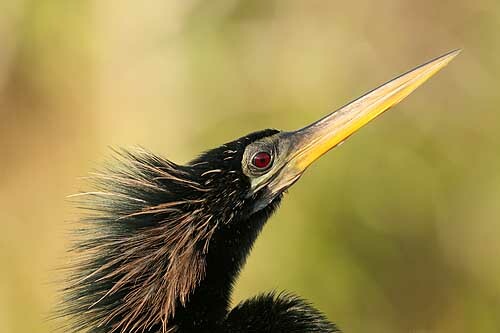 The first photo shows the Anhinga, for which the trail is named. 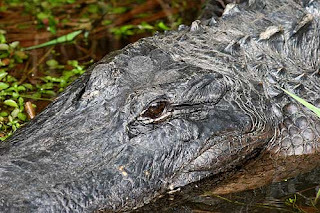 The second photo is of one of the ubiquitious alligators we saw everywhere in the water. Most amazing was the fact that the birds stalked just a few feet away from them. It was like a zoo, only without fences. For the second year in a row I am an ambassador for the Great Backyard Bird Count, which takes place from February 18-21, 2011. In connection with this event I will give a presentation at the Sewickley Library on February 16 from 4:30 – 5:30 p.m. Participating in this free event is easy, but it helps if you can identify the usual backyard suspects. A pair of binoculars also comes in handy. 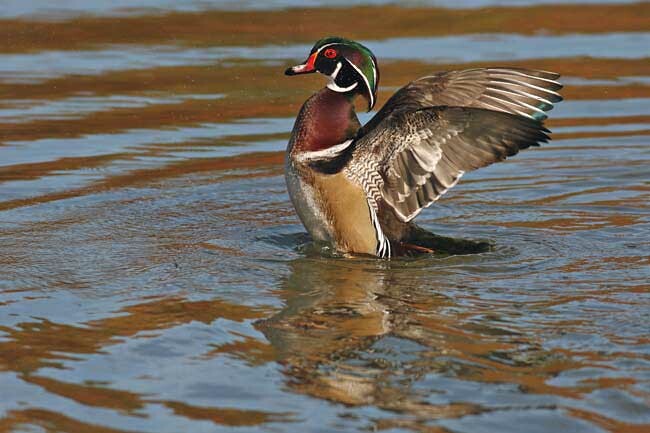 You may watch birds in your backyard, a park, or a school yard – it doesn’t matter. 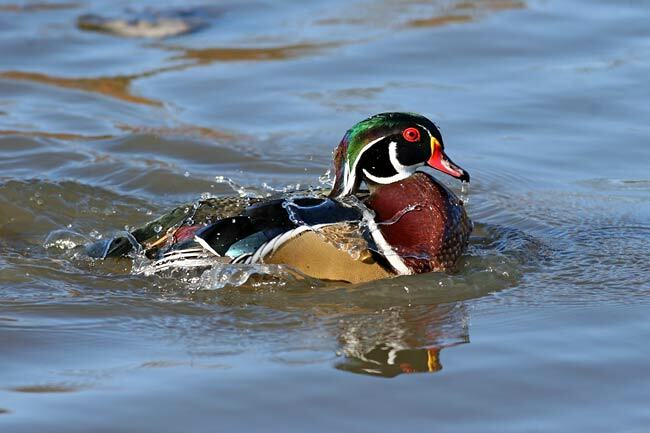 Count the highest number of birds you see at any given time and log down the location of the sighting. You may report your findings online. That’s it! Have fun. We recently purchased a bird bath heater, and it has been a hit. Apparently, birds do need drinking water during the winter just as much as during the sweltering summer heat. Keeping it filled and clean in these frigid temperatures can be a challenge, though. 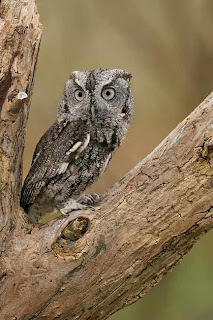 Because of the icy weather, I have been birding through our kitchen window lately. The other day I watched a crow fly into our neighbor’s pear tree. A Cooper’s hawk hiding in said tree did not put up much of a fight, but flew across our yard and disappeared. Crow – 1, hawk – 0. Winter brings many birds to our yard, including more than a dozen red-winged blackbirds yesterday. A recent newsletter by the Audubon Society of Western Pennsylvania alerted me to the fact that those reddish finches I’ve seen lately are probably common redpolls. I hope they will still be around when the weather releases its icy grip. In late October, I attended a raptor photo workshop held by Brian Zwiebel at Ohio Nature Education. 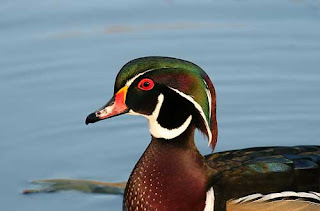 I came away with some beautiful photos of permanently injured birds, which are now being used for educational purposes. I am glad for the opportunity to get an up-close view of these awe-inspiring raptors. 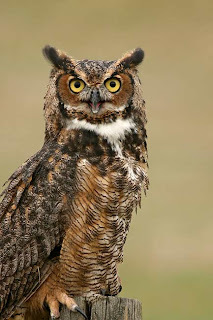 Just days before the workshop we heard a Great Horned Owl from our backyard but couldn’t see it in the dark. 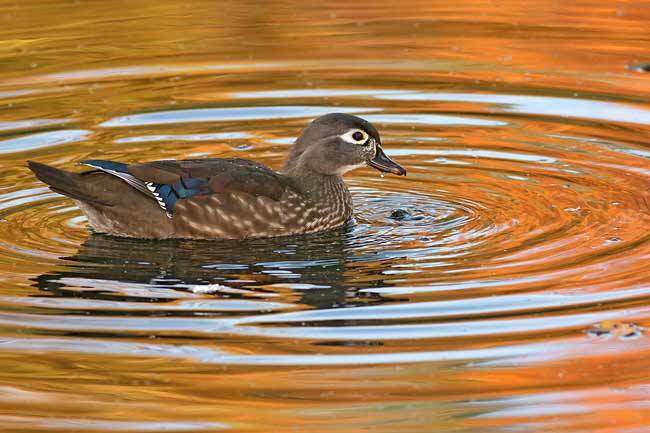 These images of a female and male wood duck depict the differences in their appearance. Fall is an especially good time to photograph them because they have just molted and look their best. 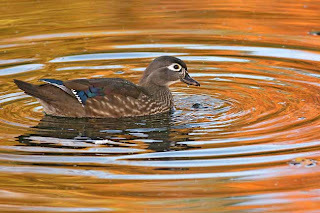 The top photo shows the autumn trees reflected in the water while the bottom photo brings out the iridescent head of the male duck. No wonder North Chagrin is so popular with photographers! The other day I set up my blind in our backyard to photograph some of the birds that visit our feeder. We had placed the feeder close, but not too close, to our serviceberry so that the birds can scope out their surroundings before flying to the feeder. The fall foliage provided a nice backdrop. I expected the usual tufted titmice, chickadees, and cardinals. When a bird sat on a perch for quite a while it seemed to be saying, “photograph me.” I did not recognize it and was thrilled that I could take almost a dozen photos before it took off. 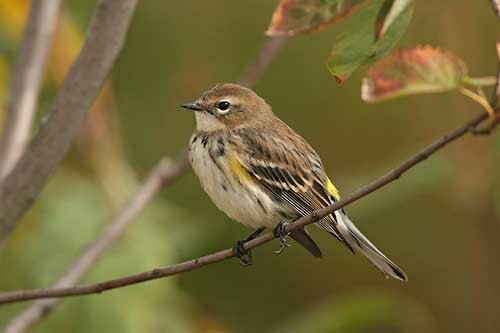 Imagine my surprise when I viewed my images on the computer and learned that the mystery bird was a “Myrtle” yellow-rumped warbler! I had never even seen this bird, ever. Sometimes the best subjects are as close as your backyard. 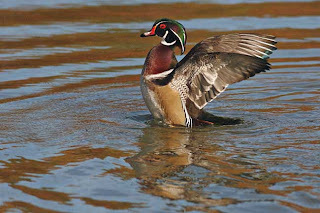 Around the same time last year I attended a photo workshop in Ohio focusing on wood ducks. I had so much fun that I decided to return on my own. This time I had plenty of sunshine. Another plus was the fact that the deck near the nature center and a trail to another deck were finished. This allowed me to zip around checking on possible photo opportunities. I knew the ropes by now and, when the lighting was good, I was ready with my camera and lawn chair to await the action. And action I got. Besides wood ducks, I also observed Canada geese, a great blue heron, red-winged blackbirds, chickadees, a robin, and a marsh wren. It is no wonder that the park was very popular with visitors young and old. I consider it one of the best places I have photographed birds at so far.